Kodō (鼓童?) 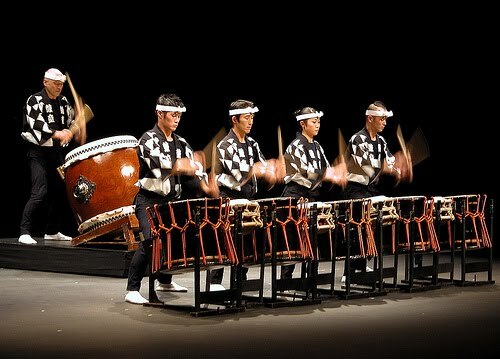 is a professional taiko drumming troupe. Based on Sado Island, Japan, they have had a role in popularising taiko drumming, both in Japan and abroad. They regularly tour Japan, Europe, and the United States. 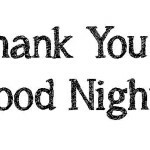 In Japanese the word “Kodō” conveys two meanings: “heartbeat” the primal source of all rhythm and, read in a different way, the word can mean “children of the drum”. 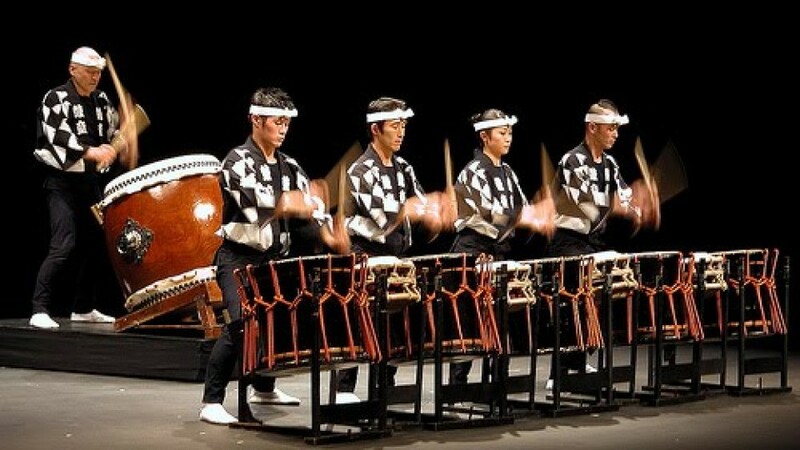 Although taiko are the primary instrument in their performances, other traditional Japanese musical instruments such as fue and shamisen make an appearance on stage as do traditional dance and vocal performance. Kodō’s repertoire includes pieces based on the traditional rhythms of regional Japan, pieces composed for Kodō by contemporary songwriters, and pieces written by Kodō members themselves. Since their debut at the Berlin Festival in 1981, Kodō has had almost 4,000 performances, spending about a third of the year overseas, a third touring in Japan and a third resting and preparing new material on Sado Island. Kodo made their debut at the Berliner Philharmonie in the same year. Kodō is sometimes considered to be simply renamed from the taiko group Ondekoza organized in 1971. Indeed, Kodō was formed out of the existing members of Ondekoza, but their leader, Den Tagayasu, left the group before the transition and lead performer Eitetsu Hayashi left quickly thereafter. Kodō is arguably the most well-known and respected taiko group worldwide and has been considered an ambassador group for taiko performance outside Japan.